$39.95 In stock - low quantity. Order in the next 4 hours, 9 minutes and it will go out today! In stock - low quantity. Order in the next 4 hours, 9 minutes and it will go out today! 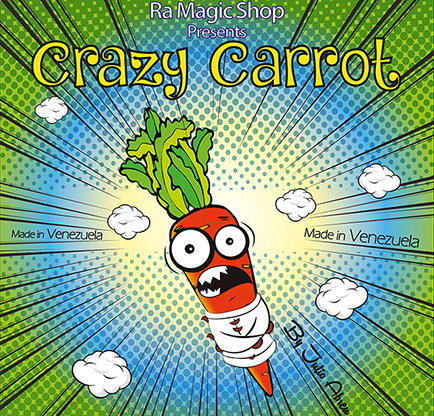 Crazy Carrot by Ra El Mago and Julio Abreu, is an interactive trick that is great for kids - they really get involved! The carrot first points to the right, then left, up and down. The kids can name the pointing direction, while the magician keeps making mistakes - don't worry, they scream to correct you! Crazy Carrot generates laughs, participation for a long time, and has a surprise ending that highlights one of the children (perhaps the birthday child?). Adapt to your own unique style. Watch the performance and it speaks for itself. Order Crazy Carrot and start hearing raucous laughter from the kids and their parents!